Hot sake has a dicey reputation, and it's mostly deserved. But at Public in New York City, master mixologist Eben Freeman is heating up quality sake and using it as the base for two warming, delicious new creations. Hot sake has a dicey reputation, and it's mostly deserved: Typical sushi restaurants use low-end sake (the stuff that comes in big cardboard cartons) because the heat masks the flavor. But at Public in New York City, master mixologist Eben Freeman is heating up quality sake—Kamoizumi Junmai Three Dots, which is specifically made to be drunk warm—and using it as the base for two warming, delicious new creations. Freeman was inspired by dashi, the umami-packed broth that serves as the base for many Japanese dishes, when he created his savory hot sake. He places a square of kombu (seaweed) and bonito shavings in the bottom of a cup. When guests pour the hot sake from the tokkuri into the cup, everything begins to steep. At first the flavors are subtle, but as you continue to refill the cup and drink the sake, more and more of the intensely savory flavors come through. It’s like a restorative, alcoholic broth. It’s comforting, cozy and unique. “It’s not for the weak of heart,” Freeman says. Freeman had hot toddies in mind when he came up with the citrus hot sake. 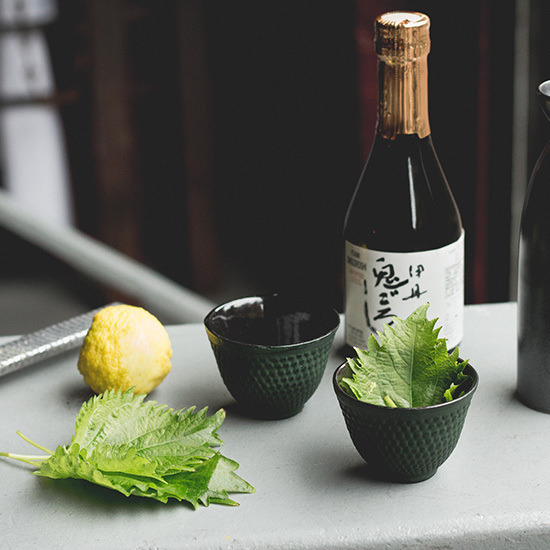 He preps a cup with a shiso leaf, yuzu juice, yuzu zest and Japanese rock sugar. Like the savory sake, the citrus sake changes over time. At first the bright, tart, nasal-clearing yuzu and aromatic shiso come through. Then, as the sugar dissolves, the drink gets sweeter, leaving you with a way-too-easy-to-guzzle hot cocktail.